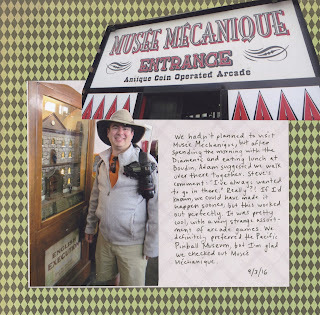 We hadn't planned to make Musee Mecanique in San Francisco one of the items on the 40-4-Steve list, but we found ourselves across the parking lot from it after eating lunch at Boudin with out-of-town friends. Steve commented that he'd always wanted to go in but never had. Really? Perfect! It was pretty neat to see the ancient arcade games, but it was significantly less cool than the Pacific Pinball Museum. Still, I'm glad we went. David loves that place... especially the clown games! How fun! LOVING how you included a photo of the entrance!!!!!!!! !